The CS-540 wireless headset system combines the clarity of traditional corded technology with the mobility of wireless, so employees can move around to wherever business takes them—without interrupting or missing critical communication. Wireless headsets transform the work environment by facilitating active collaboration and joint problem solving, increasing employee availability, and enhancing the ability to multi-task. The CS-540 is a convertible headset with many wearing options such as over the head or over the ear so it is ideal for: Nurses, Doctors, Lab Technicians, and anyone that needs to be mobile and still in full duplex verbal communication. 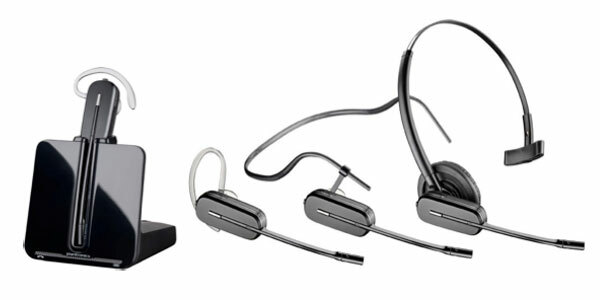 The Tech Works CS-540 wireless headset uses the HS-1 adapter (sold separately) for the IC-52 to interface and control the conversation. The HS-1 allows the installer to simply plug the headset into an IC-52. It includes automatic switching circuitry to mute the ceiling speaker and console microphone whenever the headset is in use. A 5-position Euro- style female connector plugs directly into the operator speaker and microphone connections on the IC-52. The 5-pin Euro-style screw terminal supplied with the IC-52 plugs into a mating connector on the HS-1. When used with other Tech Works products such as the new Collaborative Intercom CI-HSI-41 headset combine system no other products are required. A system can be made by simply plugging the required number of CS-540s into the CI-HSI-41. A wireless headset must be included for the operator to have hands-free communication without the use of fixed location microphone and speaker. When the headset is installed in conjunction with fixed microphones and speakers, a headset interface must be included to mute the fixed devices when the headset is in use. The headset must be a rechargeable ultra-light weight unit with a charging base and noise-canceling microphone. The wireless headset shall be Tech Works CS-540 (include the HS-1 Interface Adapter when used with the IC-52).